Limtam means "hello" in Sora, an endangered language of eastern India. This website is an overview of the Sora Language Documentation and Talking Dictionary Project currently under development by the Swarthmore College Laboratory for Endangered Languages Research and Documentation in collaboration with the Living Tongues Institute. This ongoing research by K. David Harrison and Gregory Anderson is hosted by Swarthmore College. The Sora are an indigenous people of India; their ancestors settled in India long before the arrival of the Aryan and Dravidian populations who now dominate and outnumber them. The Sora, along with related peoples of the Munda group, are ethnically and linguistically related to various Mon-Khmer peoples including the Cambodians who live a considerable distance to their east. Sora speaker and expert consultant Mr. Rowo Gamango and family, Gumma Hills, Gajapati District, Orissa State. 2007. Photo by K. David Harrison. The Sora, as well as other indigenous peoples of India, are referred to colelctively as adivasi, or 'first' peoples. Popularly known as 'tribals' or Scheduled Tribes, they exist outside of and beneath India's socially rigid caste system, lower even than the so-called 'untouchables'. 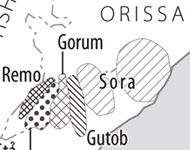 The Sora language, also known as Saora, Saura, Savara, or Sabar(a), is found in the east Indian state of Orissa and in adjacent parts of Andhra Pradesh. It is a member of the Munda language family, and with Gorum (Parengi) forms possibly the only two members of the Sora-Gorum subgroup. Though thriving in some areas, Sora is considered to be threatened overall. Sora is primarily an oral language and is not extensively written or read. Even so, Sora has been written in a variety of scripts, including a Latin-based orthography which was used by the Bible Society of India to translate the Sora Bible. Sora texts exist in the regionally dominant scripts of Oriya and Telugu as well as the indigenous script, Sorang Sompeng. All of these writing systems are relatively unknown and lack standardization. Because even Sora speakers literate in other languages are unfamiliar with any of these systems, Sora literacy is not truely viable at this time. For the purposes of this project, consultant Opino Gamango invented his own orthographic rendering (pictured at top). The Sora lexicon contains fewer loanwords than many other Munda languages. Austroasiatic elements and derivational processes abound, but some contact with Indo-Aryan and Dravidian languages is also evident. Sora's complex verbal morphology resembles other Munda languages, but its idiosyncrasies reveal it to be an early off-shoot of Proto-Munda. Sora nominals are marked for person/possession, number, and a range of cases. The phonology has contrastive, though probably not phonemic, vowel length. One salient feature is that vowels are sometimes glottalized or glotally interrupted while consonants can be pre-glottalized. This feature, at least for consonants, is seen across other Munda languages. The Sora Language Documenation and Talking Dictionary Project aims to record and disseminate information for research while also protecting a threatened minority language. The creation of a talking dictionary serves both as documentation and as a resource to the speach community. The Swarthmore College Laboratory for Endangered Languages Research and Documentation is involved in several talking dictionary projects, including ones under production with the Ho and Sora languages. 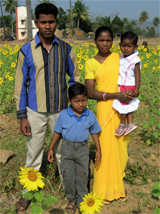 In 2007, K. David Harrison and Gregory Anderson conducted research in Sora speaking communities in India. This included initial recordings of translated word lists conducted with consultant Mr. Opino Gamango for use in a talking dictionary. Forthcoming table of sound clips. To see video footage shot in Sora villages watch "The Linguists", a documentary by Ironbound Films featuring K. David Harrison and Greg Anderson. 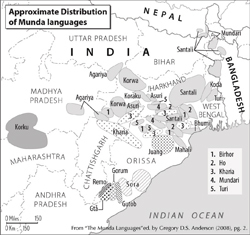 To research more about the Sora people, language, or linguistics, a good place to start is this bibliography of sources pertaining to Munda languages and cultures. Basic information is also available on the Ethnologue. 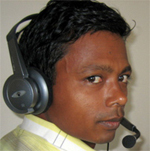 Additional information is available on Toshiki Osada's Munda languages site. Portions of a chapter on Sora by Gregory Anderson and K. David Harrison in "The Munda Languages" ed. by Gregory Anderson will also soon be made available here. © 2008 Swarthmore College Laboratory for Endangered Languages Research and Documentation. This web site was developed by Myles Louis Dakan based on linguistic field research by K. David Harrison and Gregory Anderson.